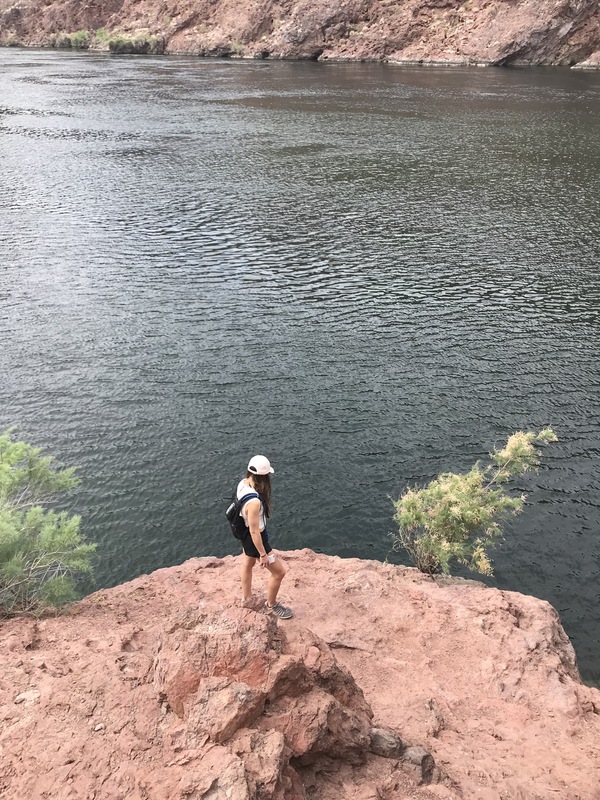 The first time hiking here, my sister and I took a wrong turn (or few) and ended up climbing some highly questionable cliffs. Questionable meaning: climbing on hands and knees as you try not to slide off the edge of the cliffside, throwing your backpack over the edge in an effort to not get snagged on overhanging rocks and toppled to your death, while trying not to cry as your anxiety screams that this is a terrible life decision. Clearly, we survived the trek, and I’ve gotten much more familiar with the terrain in this area. Whether day hiking or backpacking in to camp for a night, hopefully this post helps steer you in the right direction! From Vegas, head towards the Hoover Dam. After passing the Dam, while on U.S. Route 93 you cross into Arizona. At the mile 4 marker, there will be a left hand turn that allows you to cut across the highway, continuing up to a parking lot. This is the trailhead- there are a few informational signs posted, including a map of the trail. 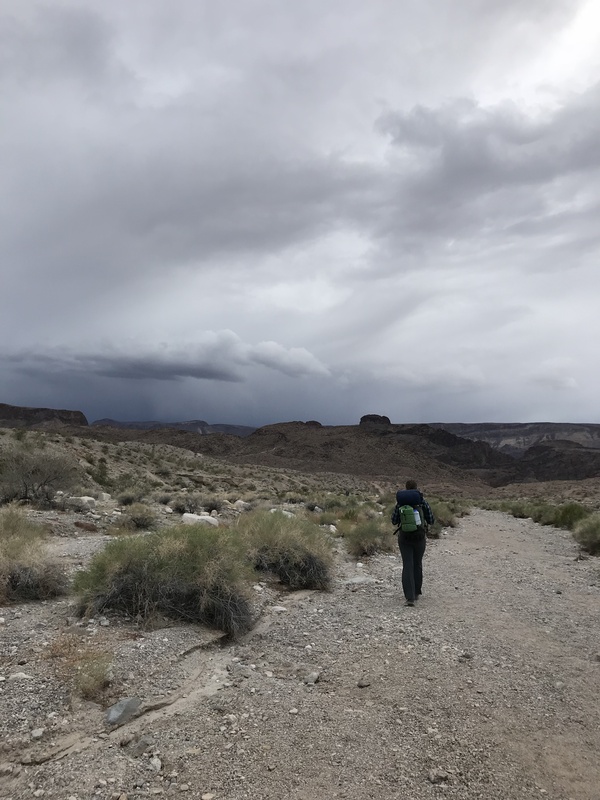 The full hike is roughly a 6 mile loop, taking you down White Rock Canyon, alongside the Colorado River, and up Hot Spring Canyon to the hot springs. 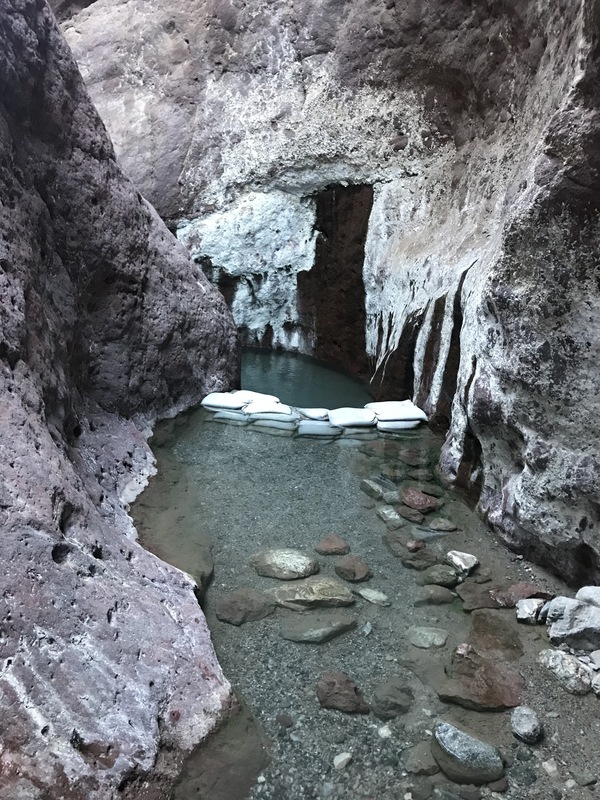 You can also head directly down Hot Spring Canyon to the springs and back, which will shave off some distance. 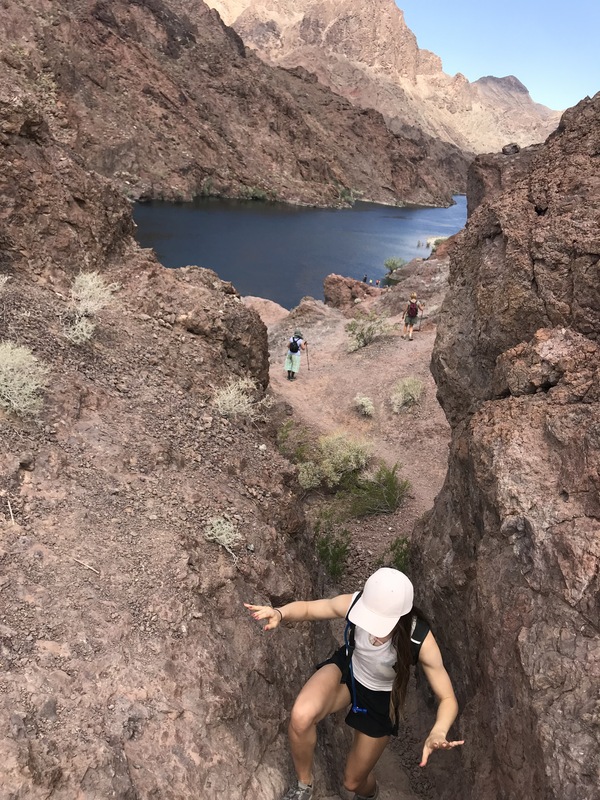 I personally prefer to hike the loop- it makes for more diverse scenery and terrain, plus you get to check out the river (living in the desert has made me extra appreciative of larger bodies of water.. well, any water really). Following the trail with the aid of a few post markers, you’ll find yourself climbing down a steep hill into Hot Springs Canyon. If you turn left, this will lead you to the springs. Turning right will take you through a camping area, and then to the river (there is also a primitive bathroom out this way). 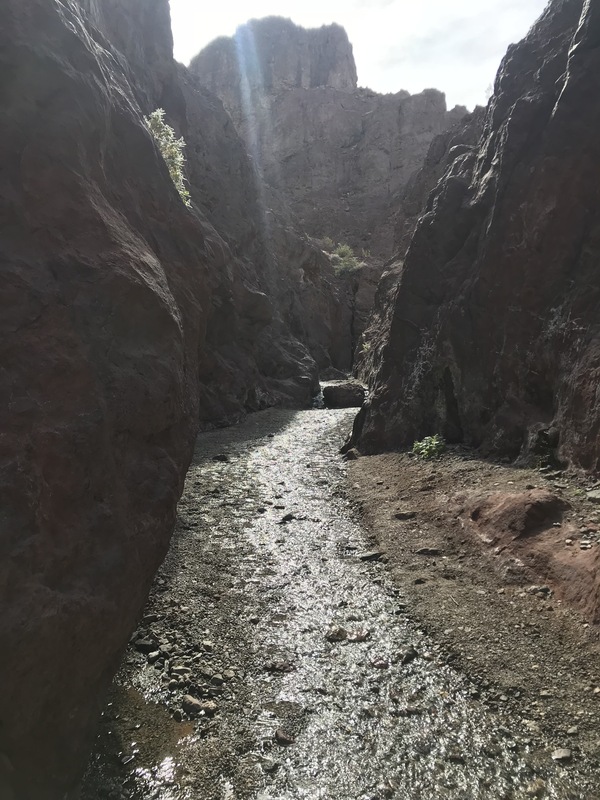 Heading to the left, you’ll be following the canyon up, where a trickling stream of water on the canyon floor slowly starts to get warmer. 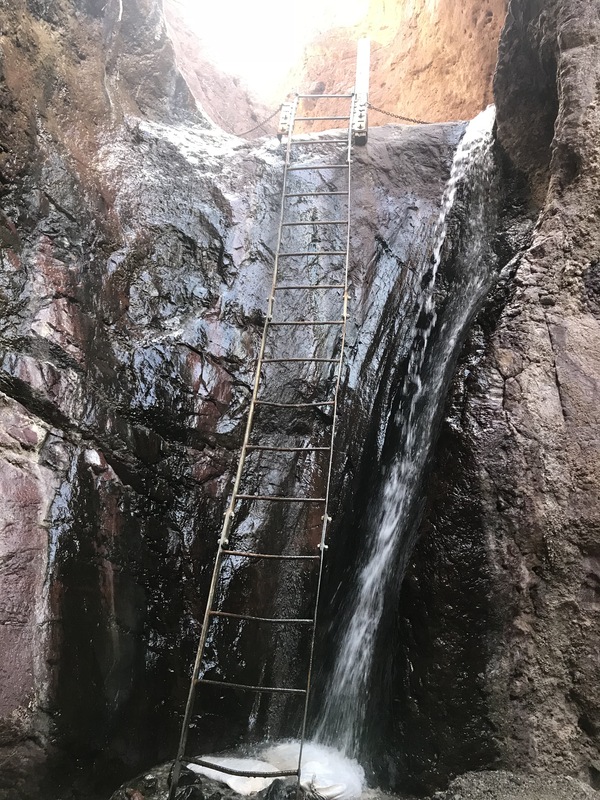 After several minutes and a few scrambles over rocks and small waterfalls, a 20′ ladder is the final obstacle before reaching the springs. Careful- spray from the neighboring waterfall makes this ladder extremely slick! There are several pools to choose from, typically increasing in temperature as you work your way up. 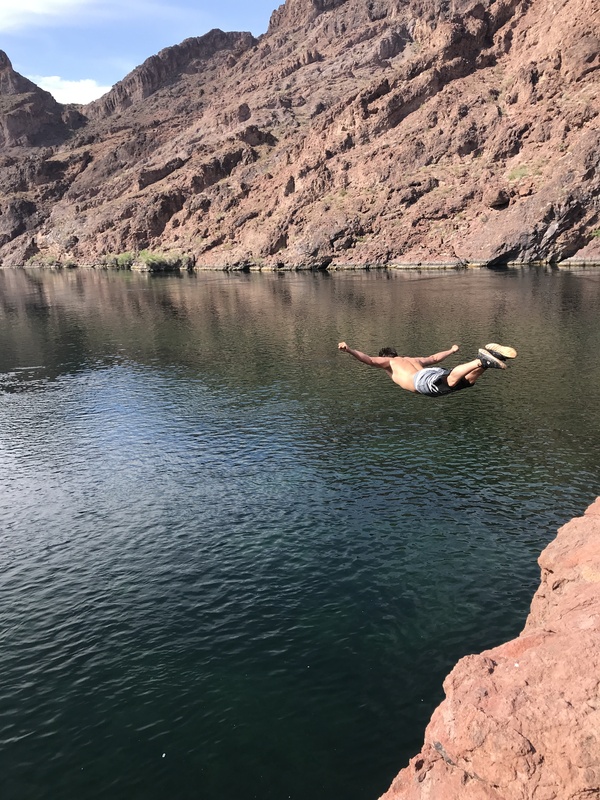 Some of the pools are deeper than others, so be careful if walking through with your dry clothes/ gear (I think the deepest pool is about waist deep at most). Pick your preference and get comfortable! WARNING- you need to keep your face out of the water (or at the very least, plug your nose if submerging). There’s a rare but lethal amoeba (Naegleria fowleri) that can lurk in hot springs- don’t worry too much, as it can only enter your body through your nose, but certainly be aware. Hiking up Hot Springs Canyon is a bit more strenuous than the hike in- there’s a particularly long hill that seems like it never ends. However, as soon as you drag yourself to the top of that final hill you’ll be comforted with the sight of the road and bridge beside the trailhead in the distance. pay attention- there’s beauty all around! 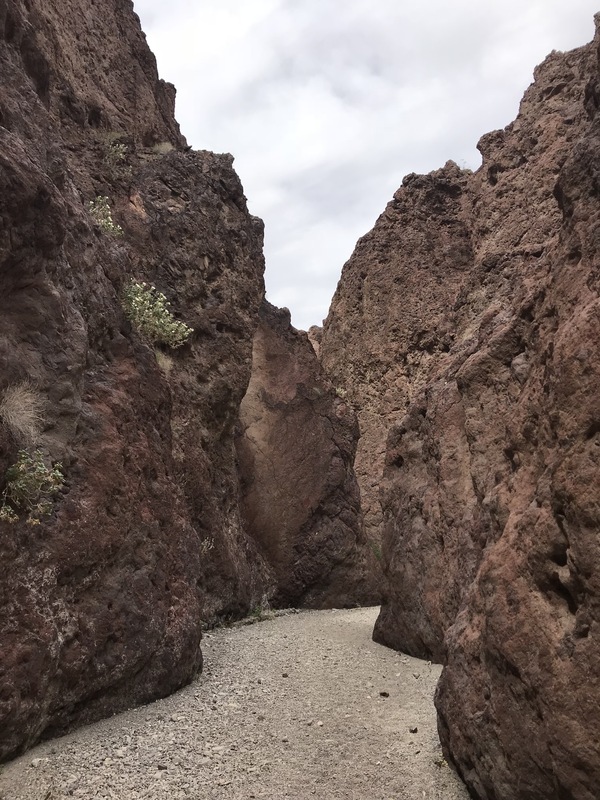 Hot Springs Canyon has a long stretch of open ground for camping – I’ve seen tons of people camping in this area, I believe there are a lot of kayak/ canoe trips that stop here for the night. Although more crowded, the benefits of camping here are: easier access to the springs, and the added bonus of a nearby bathroom. 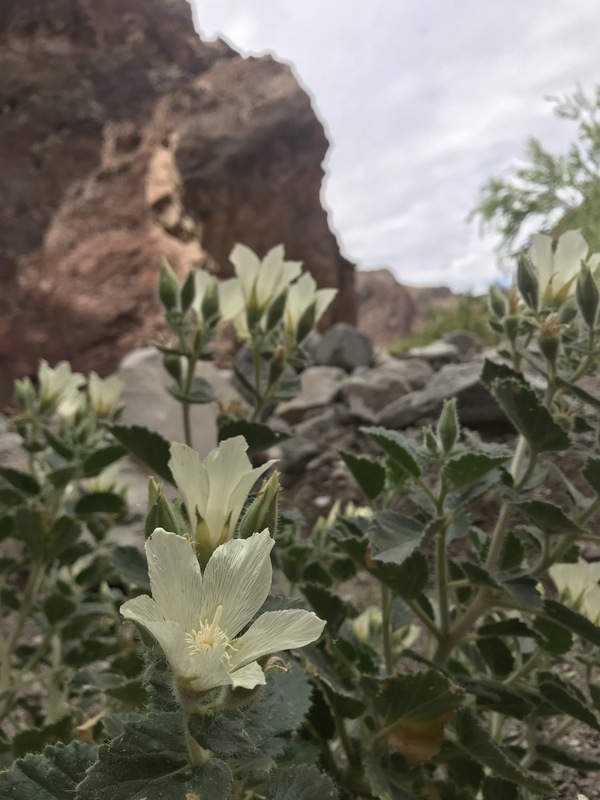 If hiking the loop, when you get to the end of White Rock Canyon there is a large rocky area that provides a more secluded camping experience, and as you walk by the river you find other spots scattered around. Be aware that the water levels can increase or decrease, so I wouldn’t recommend camping too close to the water’s edge. There’s definitely not a surplus of firewood, so if you’re intending on having a fire, plan on bringing your own. According to the helpful folks at the Lake Mead Visitor’s Center, campfires are allowed as long as you are 100′ away from vegetation, .5 miles away from a road, and don’t leave the fire unattended (please, just consider this last one a golden rule). If you camp out, try to wake up early and hit the springs- they’re much less populated in the initial morning hours! Enjoy your trip, and if you have any questions I am happy to answer to the best of my ability.